Americans thought they elected a president on Nov. 6, 2012, but those results were not official — until Friday. The votes cast in November’s general election went to pick electors from each state — members of the Electoral College — who cast their ballots based on the preferences of their constituency for one candidate or another. On Friday, Vice President Joe Biden will announce the results. Read more about Romney’s donor call HERE. President Obama Wednesday heaped praise on his defeated rival, GOP nominee Mitt Romney, saying the former governor’s record and ideas “could be very helpful” in shaping policy over the next four years. “My hope is, before the end of the year… that we have a chance to sit down and talk,” Obama told reporters in his first post-election press conference. But even as Obama extended something of an olive branch, Romney was reportedly accusing the president of doling out “gifts” to minority voters to curry their support for a second term. Four days have passed since President Barack Obama took enough of the electoral college to secure a second term and Florida has still not quite counted 100 percent of its ballots. But with the last absentee votes from overseas trickling in and precincts firming up, Florida’s Secretary of State on Saturday finally announced Obama would walk away with its 29 electoral votes. “What you guys have accomplished will go on in the annals of history and they will read about it and they’ll marvel about it,” Obama told his team Wednesday morning inside the Chicago campaign headquarters, tears streaming down his face. “I have just called President Obama to congratulate him on his victory. His supporters and his campaign also deserve congratulations. I wish all of them well, but particularly the president, the first lady and their daughters. “I extend my sincere congratulations to President Obama and Vice President Biden on their hard-fought victory, and I would like to thank Mitt Romney and Paul Ryan for running a great campaign based on concrete solutions to the tremendous economic challenges we continue to face. “The American people did two things: they gave President Obama a second chance to fix the problems that even he admits he failed to solve during his first four years in office, and they preserved Republican control of the House of Representatives. “The voters have not endorsed the failures or excesses of the president’s first term, they have simply given him more time to finish the job they asked him to do together with a Congress that restored balance to Washington after two years of one-party control. “Now it’s time for the president to propose solutions that actually have a chance of passing the Republican-controlled House of Representatives and a closely-divided Senate, step up to the plate on the challenges of the moment, and deliver in a way that he did not in his first four years in office. “To the extent he wants to move to the political center, which is where the work gets done in a divided government, we’ll be there to meet him half way. “I would like to congratulate Barack Obama on his re-election. I have really enjoyed working with him over the last few years and I look forward to working with him again over the next four years. “There are so many things that we need to do: we need to kick start the world economy and I want to see an EU-US trade deal. Right here in Jordan I am hearing appalling stories about what has happened inside Syria so one of the first things I want to talk to Barack about is how we must do more to try and solve this crisis. “First, Michael and I want to offer our congratulations to Mitt and Ann Romney – two wonderful people filled with grace, strength and love of country, and two people we are proud to call our friends. They ran a campaign that offered a vision of America that is strong, prosperous and free, and inspired millions of Americans in the process. We all owe them a debt of gratitude for their service. “Second, we congratulate President Barack Obama and First Lady Michelle Obama on their hard-fought and hard-earned re-election. Since the day he was sworn into office back in 2009, we have hoped and prayed for President Obama’s success as, more than anything, we want to raise our children in an America that’s thriving and that offers our children the same blessings and opportunities it has offered the generations that preceded them. Those hopes and prayers continue today. “In his second term, I am hopeful that President Obama will see the value of pragmatism over partisanship,” she said. “Both parties created the challenges we face today, and the solutions can only be found through collaborative efforts — good ideas don’t come with a party label. 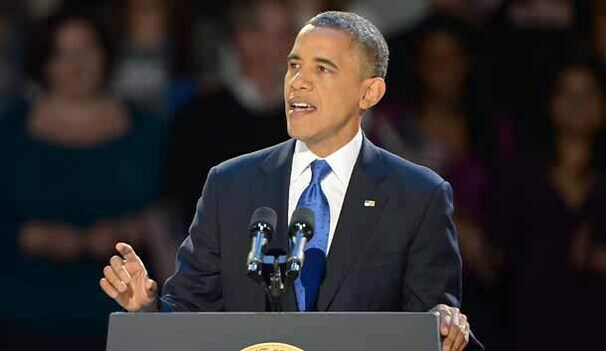 “Tonight, I want to congratulate President Barack Obama and Vice President Joe Biden on winning re-election. “This has been a spirited and tough campaign. The differences between the sides have been clear, widely discussed and vigorously debated. I strongly supported my friends Mitt Romney and Paul Ryan. I believe they would have provided exceptional leadership for this nation. I cannot thank them enough for their dedication to the principles of our party, and their commitment to helping improve the lives of the people of this great nation. Mitt Romney and Paul Ryan are honest, decent and selfless. They had big ideas that would achieve good results for all people. I wish them the very best moving forward, and I know they will stay deeply involved in the public life of this nation. We need their positive, optimistic visions as we address the pressing issues facing our country. Obama appeared before thousands of cheering Democrats to the beat of Stevie Wonder’s “Signed, Sealed, Delivered I’m Yours” after securing a strong electoral lead, although he just eked out victories in key states. love this country deeply and we care so strongly about its future. From George to Lenore to their son Mitt, the Romney family has chosen to give back to America through public service and that is the legacy that we honor and applaud tonight. In the weeks ahead, I also look forward to sitting down with Gov. Romney to talk about where we can work together to move this country forward. And I wouldn’t be the man I am today without the woman who agreed to marry me 20 years ago. Let me say this publicly: Michelle, I have never loved you more. I have never been prouder to watch the rest of America fall in love with you, too, as our nation’s first lady. Sasha and Malia, before our very eyes you’re growing up to become two strong, smart beautiful young women, just like your mom. And I’m so proud of you guys. But I will say that for now one dog’s probably enough. To the best campaign team and volunteers in the history of politics. The best. The best ever. Some of you were new this time around, and some of you have been at my side since the very beginning. But all of you are family. No matter what you do or where you go from here, you will carry the memory of the history we made together and you will have the lifelong appreciation of a grateful president. Thank you for believing all the way, through every hill, through every valley. You lifted me up the whole way and I will always be grateful for everything that you’ve done and all the incredible work that you put in. But despite all our differences, most of us share certain hopes for America’s future. We want our kids to grow up in a country where they have access to the best schools and the best teachers. A country that lives up to its legacy as the global leader in technology and discovery and innovation, with all the good jobs and new businesses that follow. We want our children to live in an America that isn’t burdened by debt, that isn’t weakened by inequality, that isn’t threatened by the destructive power of a warming planet. We want to pass on a country that’s safe and respected and admired around the world, a nation that is defended by the strongest military on earth and the best troops this—this world has ever known. But also a country that moves with confidence beyond this time of war, to shape a peace that is built on the promise of freedom and dignity for every human being. We believe in a generous America, in a compassionate America, in a tolerant America, open to the dreams of an immigrant’s daughter who studies in our schools and pledges to our flag. To the young boy on the south side of Chicago who sees a life beyond the nearest street corner. To the furniture worker’s child in North Carolina who wants to become a doctor or a scientist, an engineer or an entrepreneur, a diplomat or even a president—that’s the future we hope for. That’s the vision we share. That’s where we need to go—forward. That’s where we need to go. Now, we will disagree, sometimes fiercely, about how to get there. As it has for more than two centuries, progress will come in fits and starts. It’s not always a straight line. It’s not always a smooth path. By itself, the recognition that we have common hopes and dreams won’t end all the gridlock or solve all our problems or substitute for the painstaking work of building consensus and making the difficult compromises needed to move this country forward. But that common bond is where we must begin. I am hopeful tonight because I’ve seen the spirit at work in America. I’ve seen it in the family business whose owners would rather cut their own pay than lay off their neighbors, and in the workers who would rather cut back their hours than see a friend lose a job. I’ve seen it in the soldiers who reenlist after losing a limb and in those SEALs who charged up the stairs into darkness and danger because they knew there was a buddy behind them watching their back. And together with your help and God’s grace we will continue our journey forward and remind the world just why it is that we live in the greatest nation on Earth. Here’s the full transcript from Mitt Romney’s concession speech on Wednesday morning, Nov. 7, 2012. President Obama won a second term Tuesday night as ABC News projects he will be re-elected, emerging victorious in what had been a deadlocked race into the final hours of the campaign. Obama’s lease on the White House was renewed with a crucial victory in Ohio. Celebrations erupted in Obama’s home town of Chicago, while Romney’s Boston headquarters went mournfully quiet. 1 of 30. 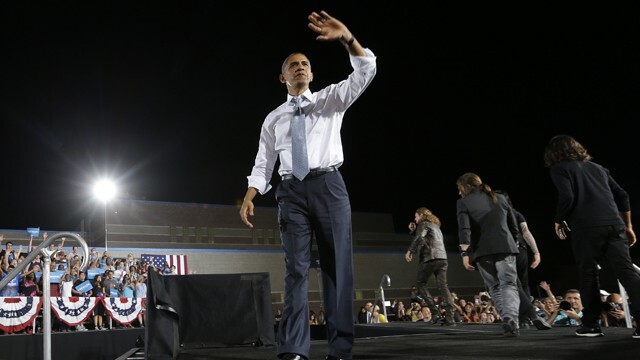 U.S. President Barack Obama greets supporters on his last night of campaigning in downtown Des Moines, Iowa, November 5, 2012. President Barack Obama won re-election to a second term in the White House on Tuesday, television networks projected, beating Republican challenger Mitt Romney after a long and bitter campaign. Obama defeated Romney in a series of key swing states despite a weak economic recovery and persistent high unemployment as U.S. voters decided between two starkly different visions for the country. President Obama and Mitt Romney matched each other state for state in early returns as attention turned to a trio of swing states where polls had closed but results were so close a winner had yet to emerge. The electoral votes of Ohio, Virginia and Florida are vital to each candidate’s success. In Virginia and Florida, lines stretched from some polling places even after they had officially closed. In the initial flurry of early returns, there were no major surprises, as tensions and excitement rose in a race so close it remained a statistical tie in many places. 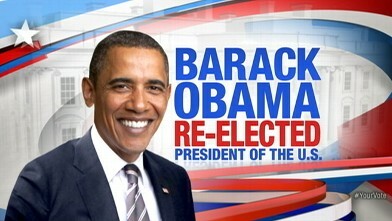 As expected Obama won his home state of Illinois and also won Romney’s home state of Massachusetts. Early on Romney picked up much of the deep South and Oklahoma, while Obama picked up the New England states. Obama also won New Jersey, the state most affected by last week’s superstorm Sandy, in which some affected voters cast paper ballots or voted via email. The state projections give Obama 173 electoral votes while Romney has collected 174. The candidates are vying to reach the goal of 270 electoral votes needed to win the presidency. The most expensive election in U.S. history is almost over, and most public polls suggest President Obama has a small, but persistent, edge over his Republican challenger, Mitt Romney. President Obama on Tuesday congratulated GOP nominee Mitt Romney on a hard-fought race and expressed confidence he would have the votes to win a second term as he kicked off Election Day with a visit to his local campaign office. The costliest election in United States history is also one of the closest, as polls open Tuesday and the country finally picks its president after a long and divisive campaign. After spending nearly $1 billion apiece, President Obama and Mitt Romney are today in much the same place they were months ago at the campaign’s outset — the president leads his Republican challenger by so small a margin it is statistically insignificant in most places. The tightness of the race was expressed at midnight, when the first town to open and close its polls — the tiny hamlet of Dixville Notch, N.H. — evenly split its vote five to five. On Tuesday, Romney will campaign up to the last minute, holding rallies in Cleveland and Pittsburgh, and doing interviews with radio stations in Ohio and Virginia. At one point even feeling the need to wipe a tear from his eye, President Obama ended his presidential campaign Monday night with an emotional appeal to voters in the state that started it all, asking Iowans to help him finish what he started four years ago. MRS. OBAMA: Thank you, guys. Thanks so much. AUDIENCE: We love Michelle! We love Michelle! MRS. OBAMA: (Laughter.) And I love you. I love you from the bottom of my heart. And I am beyond thrilled to be here with all of you. But we have to give some love up for Bruce Springsteen. I mean, gosh. (Applause.) For months, I have heard his songs played at our rallies. But I have to say, there’s nothing like seeing The Boss in person. (Applause.) Nothing like it. He has just been tremendous. He and his family and his team, they’ve just been amazing. So we want to thank Bruce for everything that he’s done for us. And more than anything else, I want to thank you all for being here tonight. I mean, as you know this is a pretty emotional time for us, because this is the final event of my husband’s final campaign. (Applause.) So this is the last time that he and I will be onstage together at a campaign rally. And that’s why we wanted to come here to Iowa tonight — (applause) — because truly this is where it all began, right here. But I will never forget the kindness and warmth and love that you all showed me and my family, especially our girls. That is truly what made the difference back in those early days when I wasn’t so sure about this whole process; back when I was still wondering what it would mean for our girls and our family if Barack got the chance to serve as President. For four years, Barack has been fighting to give every single one of us a fair shot at that great American Dream, no matter what we look like or where we come from or who we love. (Applause.) And for four years, we have all seen what I’ve seen for the past 23 years. We’ve seen a man of honor and integrity who knows what he believes and stays true to his values. (Applause.) I’m so proud of my husband. We have seen an honest man who knows the facts and always gives it to us straight. We’ve seen a man whose strength and resolve to build a better tomorrow has never wavered, never. And over these past four years, our family has been truly blessed — truly blessed — by all of the love and support and prayers that we have received from every corner of this country. And Barack has been truly blessed to have all of you by his side as we have worked together to bring that change we can believe in. I’ve come back to Iowa one more time to ask for your vote. (Applause.) I came back to ask you to help us finish what we’ve started. (Applause.) Because this is where our movement for change began. (Applause.) Right here. Right here. Right behind these bleachers is the building that was home to our Iowa headquarters in 2008. (Applause.) I was just inside, and it brought back a whole lot of memories. This was where some of the first young people who joined our campaign set up shop, willing to work for little pay and less sleep because they believed that people who love their country can change it. This was where so many of you who shared that belief came to help. When the heat didn’t work for the first week or so — (laughter) — some of you brought hats and gloves for the staff. These poor kids, they weren’t prepared. (Laughter.) When the walls inside were bare, one of you painted a mural to lift everybody’s spirits. When we had a Steak Fry to march to, when we had a J-J Dinner to fire up — (applause) — you brought your neighbors and you made homemade signs. When we had calls to make, teachers and nurses showed up after work, already bone-tired, but staying anyway, late into the night. You inspired us. And I want to take this opportunity to say one thing to all the young people and not-so-young people who’ve given so much to this campaign over the years — those of you who haven’t done this just for me, but for each other — for a laid-off family member, for a sick child, for a fallen friend — to all of you who’ve lived and breathed the hard work of change: I want to thank you. We’ve made real progress these past four years. But, Iowa, we’re here tonight because we’ve got more work to do. We’re not done yet on this journey. We’ve got more road to travel. As long as there’s a single American who wants a job but can’t find one; as long as there are families working harder but still falling behind; as long as there’s a child anywhere in Des Moines, anywhere in Iowa, anywhere in this country languishing in poverty, barred from opportunity — our work isn’t done. (Applause.) Our fight for change goes on. THE PRESIDENT: Now, the choice you make tomorrow — and you understand this; Iowans, you guys pay attention — (laughter and applause) — the choice you make is not just between two candidates or parties. It’s a choice between two different visions of America — who we are; what we believe; what we care about. It’s a choice between going back to the top-down policies that caused the mess we’ve been fighting our way out of for four years — or moving forward to a future that’s built on a strong and growing middle class. And that’s why, when we talk about change, we know what real change looks like because we’ve fought for it. We’ve got the scars to prove it. I’ve got the gray hair to show it. (Laughter.) I wasn’t this gray when I first showed up in Iowa. (Applause.) And sometimes it’s been hard. Sometimes it’s been frustrating. We understand that. But what we also know is that when we decide to make a difference, when Americans come together, determined to bring about change, nobody can stop us. We cannot be stopped. I told you I ran because your voices had been shut out of our democracy for way too long by special interests and politicians who will do whatever it takes to keep things just the way they are. And we’ve seen over the last four years, the status quo in Washington, they are powerful and they have fought us every step of the way. When we tried — and succeeded in reforming our health care system, they spent millions trying to stop us. When we tried — and succeeded — in reforming Wall Street, they spent millions to push us back. And we kept on going. But those were tough fights. But there’s some principles you got to fight for. There are times where you’ve got to take a stand. If the price of peace in Washington is cutting deals to kick students off of financial aid, or get rid of funding for Planned Parenthood, or let insurance companies discriminate against kids with preexisting conditions, or eliminate health care for millions on Medicaid who are poor, or elderly, or disabled — I won’t pay that price. That’s not a deal I will make. (Applause.) That’s not bipartisanship. That’s not change. That’s surrender to the same forces of the status quo that has squeezed middle-class families for way too long. The folks at the top in this country, it turns out they don’t need another champion in Washington. They’ll always have a seat at the table. They’ll always have access and influence. The people who need a champion are the Americans whose letters I read late at night after a long day in the office; the men and women I meet on the campaign trail every day. All those kids in inner cities, small farm towns — kids dreaming of becoming scientists or doctors, engineers or entrepreneurs, diplomats or even a President — they need a champion in Washington, because the future will never have as many lobbyists as the status quo — children don’t have lobbyists the way oil companies or banks do. But it’s the dreams of those children that will be our saving grace. And, Iowa, after all the months of campaigning, after all the rallies, after the millions of dollars of ads, it all comes down to you. It’s out of my hands now. It’s in yours. All of it depends on what you do when you step into that voting booth tomorrow. It’s just a remarkable thing, the way our democracy works. And at a certain point, all this effort and all these campaign rallies — and then it just comes down to each of us, as citizens. All of it depends on you bringing your friend, or your neighbor, your coworker, your mom, your dad, your wife, your husband to the polls. That’s how our democracy is supposed to be. The single most powerful force in our democracy is you. Moving this country forward begins with you. (Applause.) Don’t ever let anybody tell you your voice doesn’t matter. Don’t let anybody tell you your voice can’t make a difference. It makes a difference. And you know, Iowa, I try to keep my promises. So a few hours later, I wake up — and I’m feeling terrible. I think a cold is coming on. And I open up the curtains to try to get some light to wake me up, but it’s pouring down rain. Terrible storm. And I take a shower and get some coffee, and I open up the newspaper and there’s a bad story about me in The New York Times. (Laughter.) I was much more sensitive at that time to bad stories. (Laughter.) I’ve become more accustomed to these now. And I’m thinking, this woman is showing me up. (Laughter.) This is my meeting. I’m running for President. (Laughter.) And she’s dominating the room. And I look at my staff, and they just shrug their shoulders. They don’t know what to do. So this goes on for a few minutes. Now, here’s the thing, Iowa. After a few minutes, I’m feeling kind of fired up. (Laughter.) I’m feeling like I’m ready to go. (Laughter.) So I start joining in the chant, and my staff starts joining in the chant. And somehow I feel pretty good. And we brought that to Iowa. And during our rallies, this became a chant, and we’d have signs saying “Fired up, Ready to go.” And the woman, her name was Edith Childs — she became a celebrity, and she was written up in The Wall Street Journal — (laughter) — and folks did news stories on her. And this became one of the anthems of our campaign back in 2008. And, Iowa, in 2008, your voice changed the world. And Edith Childs asked me to ask you that if you’re willing to still stand with me tomorrow, if you’re willing to get your friends and your neighbors and your coworkers to the polls tomorrow, if you’re willing to make sure we finish what we started, she’s pretty sure we’ll win Iowa. (Applause.) She’s pretty sure we’ll win this election. (Applause.) And she just had one question for you, and that is: Are you fired up? THE PRESIDENT: Are you fired up? The presidential race is tied going into Election Day. The final POLITICO/George Washington University Battleground Tracking Poll of 1,000 likely voters — conducted Sunday and Monday — shows Mitt Romney and President Barack Obama each claiming 47 percent nationally. Our previous poll, conducted Monday through Thursday of last week, found the race tied at 48 percent. Although Romney and Obama have each led at times, the two candidates have stayed within the margin of error since the spring. Independents break for Romney by 15 points, 47 percent to 32 percent. Across the 10 states identified by POLITICO as competitive, Obama leads 49 percent to 43 percent. Barack Obama has inched to a slim advantage in the closing days of the 2012 presidential race, breaking out of a long-running deadlock with Mitt Romney to a 50-47 percent contest in the final-weekend tracking poll by ABC News and The Washington Post. For the past few days, all of us have been properly focused on one of the worst storms of our lifetimes. We mourn those who were lost. And we pledge to stand with those whose lives have been turned upside down for as long as it takes them to recover and rebuild. Because when hardship hits, America is at its best. The petty differences that consume us in normal times quickly melt away. There are no Democrats or Republicans during a storm – only fellow Americans. That’s how we get through the most trying times: together. That spirit has guided this country along its improbable journey for more than two centuries, especially as a nation of immigrants. People have come to America from all over the world, willing to take risks, build their dreams and make sure their kids can dream even bigger. It’s that spirit that’s carried us through the last four years. Four years ago, we were mired in two wars and the worst economic crisis since the Great Depression. Together, we’ve battled our way back. The war in Iraq is over, Osama bin Laden is dead, and our heroes are coming home. Our businesses have created more than 5 million new jobs in the last two and half years. Home values and 401(k)s are rising. We are less dependent on foreign oil than at any time in the last 20 years. And the American auto industry is back. We’re not there yet. But we’ve made real progress. And on Tuesday, all Americans will get to choose between two fundamentally different visions of what makes America strong. I believe America’s prosperity was built on the strength of our middle class. We don’t succeed when a few at the top do well while everyone else struggles to get by – we’re better off when everyone gets a fair shot, everyone does their fair share, and everyone plays by the same rules. When Bill Clinton was president, he believed that if America invested in the skills and ideas of its people, good jobs and businesses would follow. His economic plan asked the wealthiest Americans to pay a little more so we could reduce our deficit and still invest in job training and education, research and technology, better health care and a dignified retirement. And what happened? By the end of his second term, our economy created 23 million new jobs. Incomes rose. Poverty fell. Deficits became the biggest surplus in history. The path Governor Romney offers is the one we tried for eight years after President Clinton left office – a philosophy that says those at the very top get to play by a very different set of rules than everyone else. Bigger tax cuts for the wealthy that we can’t afford. Encouraging companies to ship jobs and profits overseas. Fewer rules for big banks and insurance companies. Vetoing the DREAM Act and making life so miserable for undocumented workers that they’d “self deport.” They’re the policies that caused this mess in the first place. In the closing weeks of this campaign, Governor Romney has started calling himself an agent of change. And I’ll give him one thing – offering another $5 trillion tax cut weighted towards the wealthy, $2 trillion in defense spending our military didn’t ask for and more power for big banks and insurance companies is change, all right. But it’s not the change we need. We know what real change looks like. And we can’t give up on it now. Change is an America where people of every age have the skills and education that good jobs require. We took on banks that had been overcharging for student loans for decades, and made college more affordable for millions of students, including Latinos. Now we’ll recruit 100,000 math and science teachers so that high-tech, high-wage jobs don’t end up in China, and train 2 million workers at community colleges for the skills local businesses need right now. Change is an America that’s home to the next generation of manufacturing and innovation. I’m not the candidate who said we should “let Detroit go bankrupt,” I’m the president who bet on American workers and American ingenuity. Now I want a tax code that stops rewarding companies that ship jobs overseas, and starts rewarding companies that create jobs here; one that stops subsidizing oil company profits, and keeps supporting clean energy jobs and technology that will cut our oil imports in half. That’s how we create jobs and support the entrepreneurial spirit of Latino workers and small businesses. Change is an America where we lift the shadow of deportation hanging over millions of people and help them earn their citizenship. We proposed a change in our laws to cut the red tape so U.S. citizens aren’t unfairly separated from loved ones while waiting for a green card. Then, instead of waiting for Congress to act, I took action so that patriotic young people who are Americans in every way except on paper no longer have to fear being deported. But this is not a permanent solution, so I will continue to work with anyone in Congress to pass the DREAM Act and enact comprehensive immigration reform to create a legal immigration system that rewards hard work and demands responsibility. Change is an America that turns the page on a decade of war to do some nation-building here at home. So long as I’m commander-in-chief, we’ll pursue our enemies with the strongest military in the world. But it’s time to use the savings from ending the wars in Iraq and Afghanistan to pay down our debt and rebuild America – our roads and bridges and schools. Change is an America where we reduce our deficit by cutting spending where we can, and asking the wealthiest Americans to go back to the income tax rates they paid when Bill Clinton was president. I’ve worked with Republicans to cut a trillion dollars of spending, and I’ll do more. I’ll work with anyone of any party to move this country forward. But I won’t agree to eliminate health insurance for millions of poor, elderly, or disabled on Medicaid, or turn Medicare into a voucher just to pay for another millionaire’s tax cut. The folks at the very top don’t need another champion in Washington. The people who need a champion in Washington are the Americans whose letters I read at night; the men and women I meet on the trail every day. The cooks and cleaning staff working overtime at a Las Vegas hotel. The furniture worker retraining for a career in biotechnology at age 55. The teacher who’s forced to spend less time with each student in her crowded classroom. The DREAMer who dreams of becoming something great. Every Latino small business owner trying to expand and do right by his or her employees – all of these Americans need a champion in Washington. When these Americans do well, America does well. That’s the change we need right now. It’s time to finish what we’ve started – to educate our kids, train our workers, create new jobs, new energy, and new opportunity – to make sure that no matter who you are, where you come from, or how you started out, this is the country where you can make it if you try. The America we believe in is within our reach. The future we hope for is within our sights. That’s why I’m asking for your vote this Tuesday. A defeat for Barack Obama on Tuesday would be no ordinary loss for Democrats. It would be a traumatic experience: the death of the dream of liberal realignment embodied in Obama’s insurgent 2008 campaign. And it would be all the more distressing to Democrats because so many of them fervently believe they will win tomorrow. Campaign Headlines November 5, 2012: President Barack Obama: We Have the Votes, But Will They Show Up? Obama: We Have the Votes, But Will They Show Up? President Obama says he is entirely confident that a sufficient number of Americans back his bid for a second term, but that motivating those voters to show up at polling places Tuesday remains a challenge that could determine the election’s outcome. “We have enough voters to win, it’s just a matter of whether they show up,” Obama told syndicated radio talk show host Warren Ballentine in a taped interview that ran Monday morning. “Obviously there are going to be some voters who at this late date may still be undecided, and if they are, I am making a closing argument,” he said. “But the main thing I want everybody to understand is that the number of undecided voters at this point is much smaller than the number of voters who support me but just aren’t voting. The candidates will spend the final 24 hours of this long presidential race bouncing around the country, rallying supporters at 14 scheduled events across nine battleground states. President Obama is set to hit urban centers in Wisconsin, Ohio and Iowa on Monday, with Bruce Springsteen tagging along as his opening act. Jay-Z is scheduled to join the campaign at a mid-afternoon gathering in the Buckeye State. President Obama has maintained a sizable advantage over Mitt Romney in trust to handle a major crisis and regained his lead in being seen as the stronger leader, wielding the benefits of incumbency to stay competitive — economic discontent aside — in the razor-close 2012 election. See a PDF with full results and charts here.